St. Paul Mayor Chris Coleman has witnessed five Mississippi River floods in his city in just the past decade. In 2016, historic floods hit parts of the Mississippi in Missouri and Arkansas in January. They hit Baton Rouge, La., in August. Arkansas saw devastating floods again last week. Damages from several of those recent Mississippi River floods have surpassed $1 billion. The flooding has also made shipping up and down the river less reliable, Coleman said Tuesday. "One year we have a drought and you can't get into a port, the next year we have flooding and you can't navigate on the Mississippi River," he said. "Those have a dramatic impact." Coleman serves as co-chair of the Mississippi River Cities and Towns Initiative, a group of city leaders who have pooled their resources to work together on environmental and economic challenges that affect the river corridor. 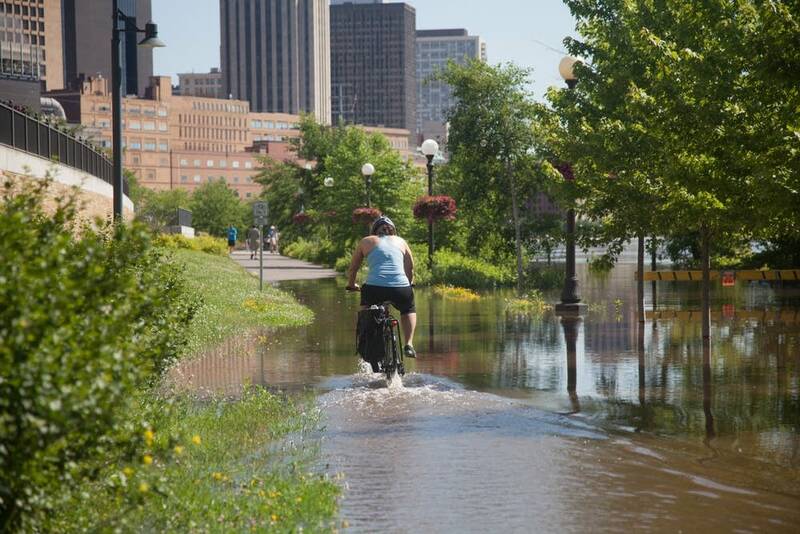 He and other city officials are among about 1,000 people from 47 states and several countries participating in the National Adaptation Forum in St. Paul this week. Now in its third year, the forum brings together city planners, scientists and others to discuss strategies for dealing with rising seas, heavy rains and warming temperatures. The 10 states along the Mississippi rely heavily on the river to move grain and other commodities for export, Coleman said. That's why he and his fellow Mississippi River mayors are urging President Trump to reconsider pulling the U.S. out of the Paris Climate Agreement, saying it would be bad for their cities' economies. The climate agreement, reached in late 2015, puts countries around the world on a path to reduce greenhouse gas emissions and keep global temperatures from rising more than 2 degrees Celsius. Trump has said he's considering pulling out of the agreement, though a White House meeting on the question scheduled for Tuesday was canceled. City leaders said U.S. government officials need to be at the negotiating table on climate so they can take full advantage of investments that might help the Mississippi River corridor deal with flooding and other effects of climate change. "These are getting very expensive, these are getting repetitive," said Colin Wellenkamp, executive director of the Mississippi River Cities and Towns Initiative, said of the floods. Wellenkamp said mayors were relieved Congress maintained climate adaptation programs in the latest federal budget. Meanwhile, funding for a host of related programs are at risk as President Trump and Congress negotiate next year's budget. The National Adaptation Forum, which runs through Thursday, focuses on issues including mass migration from sea level rise, ecosystems transitioning to a warmer climate and addressing disparities in climate impacts among low-income populations of color.